The modern saving-energy technology is getting better and better, the hydraulic press for cooling is relatively getting less and less. At the same time, most material for injection machine is alloy products. Therefore, the casting for heating equipment power isn’t as high as casting industry. But for the manufacturing system of injection or die casting industry, the cooling plays an important role as both of them are required from the raw material heating to the final casting forming. Why does limescale build up? 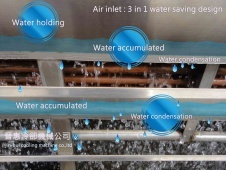 To increase the production speed in the manufacturing process, people usually choose cooling tower as cooling equipment. 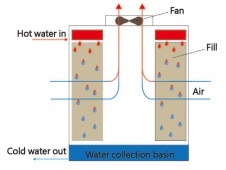 But in the cooling process, the cooling water evaporates but impurities stayed; and further, impurities concentration are getting higher and higher, finally encounters heat to form limescale through water circuit and result in the blockage of water circuit. Many customers are bothered by limescale, we usually recommend that customers use closed circuit cooling tower to overcome limescale problem! 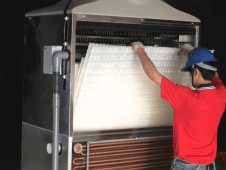 Differed from traditional water softener or putting chemical into water circuit, the biggest characteristic is that the internal heat exchanger of closed circuit cooling tower is used to separate cooling water for industrial process (inner water) and cooling water for cooling tower (outer water), ensuring that cooling water for process equipment is always clean.